KOL, you've gotten Rift Auspikitan wrong twice now. Atomic owns it. Okay so. Since Darv hasn't done it yet, he joined Solea and Rift Auspikitan, and I'm not sure but I believe Naru agreed to give Auspikitan over to Darv/Solea and Rift Auspikitan. So I can only go with that. I spotted this, what is this? Did Matty do this? Even if he did this, I will not accept people just going there and pouring lava and water all over the place. If they want to do that they must claim the region and state who they are so we know what their intentions and plans are with that, because that case simply looks like griefing imo. It even looks like the thing has blocked the road. We cannot accept this invasion and damage to our public infrastructure. That's from when a bunch of us were visiting ampluterra and got to fooling around a bit and then it was night and, you know, kipz architecture. Although I don't remember it being THAT big. I'm pretty sure Kipz didn't mean to block the road there. Edit: Spotted an empty chunk in the Desertopia region on the border between Desertopia and Forssa, near the road to Guodesia. No idea if that's a corrupted chunk or just a chunk that was deleted by accident. Edit: Yqt said that it's just a rendering error, so nvm. I think opening it up to everyone is a bad idea. Someone should take over the region so it doesn't turn into anarchy. I could hold or Matty could hold it until we find someone who wants to develop it. Nah, it's okay, we didn't go around destroying stuff or anything like that and had no intention of destroying anything. That's the past. I'm more worried about the future, based on that. What happened in the past can happen in the future if nothing changes to prevent it. Kol Bla, I know it can. I was sneakquoting movies. B-ong, I locked your chests, you may want to reconsider your message. Also, who is "His"? Please refer to the specific person. Hi hello yes I released control of Ampluterra for someone else to have or maybe just become part of Blacraft I dunno. Admittedly this is some fault on my part for not putting this up to Bla so he could oversee some kind of transfer. Am I in control of its territory? Like, I can modify it. When you got banned you gave ****atar to me. Is it still mine or is it "yours", despite you being banned? I hate snow now, it's hard to build when it snows year-round. Imagine building a skyscraper in the winter when every night torrential snowfall happens. We don't know if that will actually happen. De-icing the river would be good though. However, yqt said that he won't be able to do it until the next map cropping, which is 1.6 of course. I have a few changes for Guodesia once we return to the vanilla server. First of all, I am disbanding the Protectorate of Bohemia, and ceding most of the land back to the server. Secondly, I will be integrating what is left of Bohemia as an integral part of Guodesia. I hope you all enjoy. cool, need any help with the ideas or anything? sorry, second contact doesn't work the same way as first contact. If we ever get around to updating the map, I've been working on making some changes to the layout of my regions. I currently have the GIMP file on my computer and it won't be until nearly July 20th that I'll have good enough internet to actually upload it for Bla or I to edit. Being in Europe for a week has given me many ideas. Might rebuild Capital for the 9000th time, might get too lazy for that and just leave it the way it is. 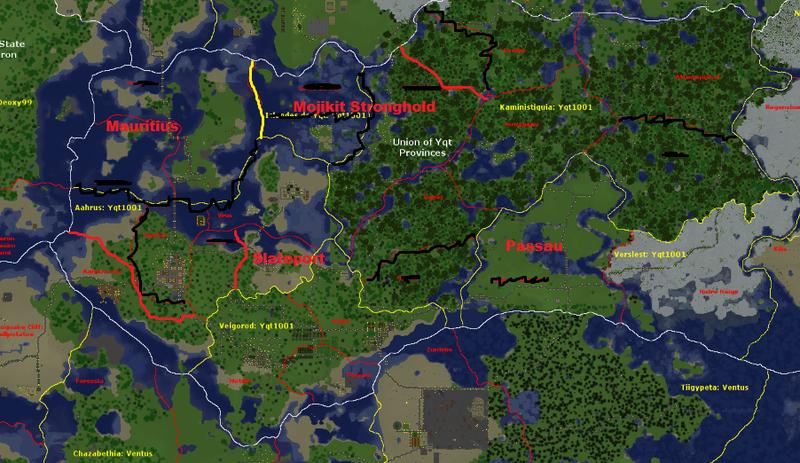 Got ideas on how to build Polyani (and the rest of Velgorod) as well as Passau. Mauritius is still planned on being a spot for testificates...eventually will do this maybe. Now that bo­ng is unbanned, I give Bon­gatar back to him. What do people think should happen to Spheron Rilmu, now that Deoxy99 is permabanned? Is anyone interested in taking over the region? What should happen to the hotel? I think we should preserve it, but remove the flag and let the regional manager edit it if it wants to, and rename everything Deoxy named. Edit: Alfonzo99 has claimed the region between Spheron Rilmu, Desertopia, Welptopia, Mt. Olympus and Islandes de Yqt. The region is still unnamed and Alfonzo99 has decided to join UBSR. He has also built a small building by the Yukitown municipality's east coast, which Ventus/Naru may want to see. Coolman1220 has also joined the server and claimed Spheron Rilmu, which has been renamed to Azecliffs. Well, I guess the question of what to do with Sphereon Rilmu got answered. Anyways, as far as the hotel, I say preserve it, though the regional owner can do remodelling or whatever to it as long as it's maybe not completely demolished all at once. I said Coolman could do whatever he wanted with it and the region, I removed the flags and some signs with Spheron etc. on them. I don't think he's interested in destroying the building, it would seem sort of pointless, but meh, Deoxy would have done the same to us if he could. Yqt has the GIMP file and if I remember correctly he said he couldn't upload it or something for a long time. You already changed Lotservania to Bongatar once I hope you will be more certain in your name choices because having to change the map/wiki repeatedly because of a name change isn't very nice. oh i didn't realize you had to do that much but if it is then leave it as it is. It's not that hard to change currently, but it becomes more hard to change if we start wiki pages on it. I'd say consider the change for maybe a week then tell me what you think. I don't know if I will allow it to be changed another time afterwards. You already changed Lotservania to ****atar once I hope you will be more certain in your name choices because having to change the map/wiki repeatedly because of a name change isn't very nice. Yqt said he was doing a bunch of border and name changes, then again, he was going to do or had done the changes himself in GIMP. Besides, Pundia sounds like it's supposed to be some kind of joke and I think B-ongatar (minus the - ) is better than Pundia. My changes were mostly municipal, removing and renaming municipalities. The biggest thing I changed was removing a region that has no use and no one really knows of. Nothing as big as renaming a region that is in common usage.